To Cite: Hatami H, Neisi A, Kooti M. Functional, Structural and Non-Structural Preparedness of Ahvaz Health Centers Against Disasters in 2014 – 2015, Jundishapur J Health Sci. 2017 ; 9(1):e66561. doi: 10.17795/jjhs-34239. Background: Ahvaz metropolitan as an industrial pole and special geopolitical location is vulnerable to miscellaneous disasters. Public health centers are one of the most important units that should have necessary preparedness against disasters and crisis. Objectives: The current study aimed to determine functional, structural and non-structural preparedness of public health centers against natural and manmade disasters at all levels, rural health houses, rural and urban health centers and the Iranian health centers. Materials and Methods: The current descriptive cross-sectional study was carried out on about 47 rural health houses, rural and urban health centers and Iranian health centers of Ahvaz city (western and eastern regions). A checklist of Iran ministry of health, field observation and interview methods were used for data collection. Functional preparedness included crisis management framework, planning, insurance coverage, event management system, public services, education and manure. Non-structural preparedness was assessed in three levels as desirable, mid desirable and undesirable. Structural preparedness included instruments, structures and facilities of the health centers. All calculations were performed by excel software. Results: Risk rate, functional, non-structural and structural preparedness and final safety level were 58.62%, 51.48%, 54.82%, 33.97%, and 43.72%, respectively. Conclusions: According to the results, the Iranian public health centers preparedness against disasters before, during and after accidents were in safety level 4 from 10, which was undesirable. Natural disasters, whether they occur in advanced or developing nations, can destroy people’s lives. Natural disasters such as earthquakes, tsunami or typhoons cannot be prevented (1). In general, disasters can be classified into four major groups. The first type is natural disasters which comprise hydrological disasters (floods), meteorological disasters (storms or typhoons), climatological disasters (droughts), geophysical disasters (earthquakes, tsunamis and volcanic eruptions) and biological disasters (epidemics and insect infestations). The second type of disaster is technological disasters, i.e. industrial accidents (chemical spills, collapses of industrial infrastructure) and transport accidents (by air, rail, road or water transport). The final two disasters are manmade which include economic crises (hyperinflation, banking crisis, and currency crisis) and violence (terrorism, civil strife, riots, and war) (2). Disasters such as terrorist attacks, chemical explosions, industrial accidents, collapsing buildings, transportation accidents and wars, potentially, have great life and financial risks (3). According to the world disasters report (2010), Asia is the continent most prone to disasters. during the past decade, Asia experienced more than 2,900 disasters (40% of the world total), affecting more than 2 million people (85%), killing more than 900,000 people (84%) and causing more than US$ 386 billion damage (39%) (4). Iran ranks tenth in the disaster prone countries in the world and the fourth in Asia; therefore, out of 40 types of known disasters in the world, occurrence of 31 of them is reported in Iran, which dedicates a total of 6% of all accidents and adverse natural disasters in the world (5). Preparedness is one of the main stages of crisis management cycle. Prepared communities that have coped potential with large and small disasters have great capacity for reconstruction and recovery. Preparedness increases the ability of government and people in different stages of crisis management. Health and rehabilitation centers are among the organizations that should have a detailed plan for crisis management (6). Preparation of the health sector as the institution providing health services is necessary and vital in reducing mortality and physical injuries resulted from accidents, crisis and emergency situations, significant and efficient organization and management of the health care centers at the time of crisis has great influence on optimal and efficient functionality of these institutions (7, 8). In many developing countries, health facilities and the education and training of health professionals constitute a major capital investment. From epidemics to conflicts, natural disasters to technological emergencies, this human and physical infrastructure is highly fundamental for the survival of the population. Yet health systems are also vulnerable to major events. After the 2004 Indian ocean tsunami, in Sri Lanka alone the health physical infrastructure losses included at least 92 partially or fully damaged health institutions. They included hospitals, drug stores, cold rooms, preventive health care offices, health staff accommodation facilities and district health offices. The loss of health care personnel included medical officers, nurses, midwives and support staff. Furthermore, a large number of health care staff were injured, traumatized or displaced by the event, hence unable to assist the affected (9). Ahvaz county in Khuzestan province is a province capital with special geopolitical importance and industrial hub with an area of 200 square kilometers and the total population over 1.4 million people. Ahvaz is the largest and most populous city of the province. Ahvaz is an industrial city with oil and gas related industries, steel industries, pipe plant, thermal power plant, sugar industry and tens of small and big industries. The current study aimed to determine functional, structural and non-structural preparedness of Iranian public health centers against natural and manmade disasters in all levels, rural health houses, rural and urban health centers and Iranian health centers. The current cross-sectional study collected data through field inspection, interview and direct observation and document audit methods. Study area was Ahvaz eastern and western health centers which included several urban and rural health centers and also primary health care base (PHCB) in urban areas and primary health care house (PHCH) in rural areas. Fifty two health centers were selected from the total 95 centers in both eastern and western areas of Ahvaz. The study used the checklist developed by the Iran ministry of health, validated by the ministry experts, as a data collection tool (10). The first part included demographic information and data regarding the threatening risks of every center including the natural and unnatural hazards of kidney, geological, climatic, biological hazards, social phenomena, technological and man-made hazards (in this part, the level of risk was evaluated in four categories: no risk, zero or below 1; the average, number 2 and number 3 in terms of the probability of high risk) were taken. The second part of the study assessed fitness center operation based on documentation review, which included review of 32 departments and areas of the structural aspects of planning, insurance, systems scene management, logistics, services, training and exercises, fire, rapid response and preparedness team headquarters units and more. The level of preparation was classified into three levels of undesirable: number1; moderate: number 2 and number 3 was better defined. The third part of the non-structural vulnerability that included technical equipment and evaluated administrative aspects puts the environment and spaces within the center of the blade. These indicators on technical equipment and administrative positions were carefully observed and thoroughly assessed, and checked; after finding the center of biological agents, were compared with standards and solutions to improve the conditions of biological safety such as tightening measures in place, putting down vulnerable or dangerous goods in classes, dressers and cabinets; to lock closets and cabinet doors, delete unnecessary run out, locked bed or wheelchair wheels, ensuring the safety of installations and electrical connections, gas and water pipes, and fittings, telephone wires and connections ; replace worn or layout that damage and block the exit route during emergency evacuation and vulnerability. Damage causes each of the three levels of safety equipment to be measured low safety: safety not met or zero, average safety: safety tips partly met and high safety: health and safety are strictly adhered to. Number 2 calculated overall vulnerability equation based on capacity/vulnerability × risk = hazard arriving on the same basis points safety was measured. Excel forms of assessment were mainly based on non-structural guide harm reduction in health centers (10); as well as a practical guide to minimize buildings with non-structural components caused by earthquake published by prevention and disaster management agency in Tehran. Statistical analysis, descriptive and analytical statistics were carried out using excel 2010 (safety assessment the software) designed by office of disaster risk reduction, Iran ministry of health. Results showed that threats percentage for health centers of west and east Ahvaz were 53.6% and 61.2%, respectively. Total risks for the whole Ahvaz was 58.62%. Operational preparedness of disaster management percentages (organizational aspects, insurance coverage, etc.) in the west, east and whole Ahvaz were 50.07%, 52.89% and 51.48%, respectively. The highest operational preparedness percentage was 56.43% in east Ahvaz health center. For non-structural part, (administrative and technical equipment) in west, east and the whole Ahvaz county preparedness percentages were 56.81%, 52.84% and 54.82%, respectively (Figure 1). The highest percentages of non-structural preparedness in east Ahvaz health centers were in the centers one, two, three, seven, eleven and primary health care base (PHCB) were 59.05%, 60.39% , 56.25%, 59.66%, 64.41% and 57.69%, respectively. Minimum preparedness percentage for non-structural factors was in the east Ahvaz health headquarters, 12.33%; and maximum preparedness rates were in primary health care base (PHCB) of cane industry with 65.03% and Mujahid PHCB with 64.55% and Daghagheleh PHC house with 64% and PHCB was 62.04% in Mallashieh, and in UmTomir PHC House was 61.32%. Structural preparedness percentage in areas covered by the west Ahvaz and east Ahvaz health headquarters were 32.69% and 35.24%, respectively and for Ahvaz county was 33.97%, (Figure 1). In the health centers of east Ahvaz, minimum safety level was measured in Ghyzanyh and Broomi health centers with 29.57%; the highest level was in PHCB number 1 of the health center number 7 with 71.93 and the health centers number 11 and 8 with 59.66% and 59%, respectively (Figure 1). Maximum structural preparedness percentage in east Ahvaz was 90% for PHCB number 1 in health center number 7; and Minimum was in Ghyzanyh, Broomim and Heath Center number 2 with 10%. In west Ahvaz, maximum structural preparedness was in Pardis health center with 100%, west heath center headquarter and Mallashieh and Daghaghelh PHCB with 90%; but minimum structural preparedness was in Albaji PHC house with zero percent and Mujahid PHCB and Um Tomir PHC House with 10%. Total safety level of West Ahvaz was 43.40%, and for east Ahvaz was 44.05%. Ultimate safety level for the whole Ahvaz country was 43.725% (Figure 1). United States national security department in national crisis management context considers disaster preparedness as one of the crisis management stages that include data collection, research, planning, organizational development, resources supply, education, training, obtaining documents and certificates, equipment, records management and publications (11). WHO introduced lack of training to prepare for unexpected accidents and disasters in state level and ordinary people as one of the main reasons for high damage from natural disasters (12). In the current study, educational preparedness of health centers was about 33.3% which is low and undesirable, but a similar study on Uromia hospitals by Hekmat Khah et al. (13) stated that preparedness was 28.5%. Another study by Arab et al. (14) reported that preparedness in Tehran hospitals was 41.37%; Hosseini Shokouh et al. (15) reported that preparedness of Iran university hospitals in Tehran was 48.67% (Figure 2). In the study by Salari et al. preparedness percentage in training of hospital staff was 61.5% (12), which is almost double the results of the current study, but the current study results is different from those of the study by Gomez et al. (16). Gomez found no training exercises to cope with disasters in the last two years. He stated that it was due to low level of preparedness and lack of a comprehensive program management to train the interested groups to deal with risks in the region. They concluded that inter-sectorial and cross-sectorial coordination should be promoted. Also, education, manure and training should be implemented. Veenema et al. reported that disaster preparedness training programs for health workers can reduce mortality rate of the affected people (17). Human resources management, staff organization and principle of unity of command are important to improve disaster management in health centers (15). Incident command system was low similar to the other above mentioned domains (47.2%). In the current study except rapid reaction teams, there was no awareness regarding incident command system. In both centers (east and west Ahvaz) command chart was not defined (Figure 2). 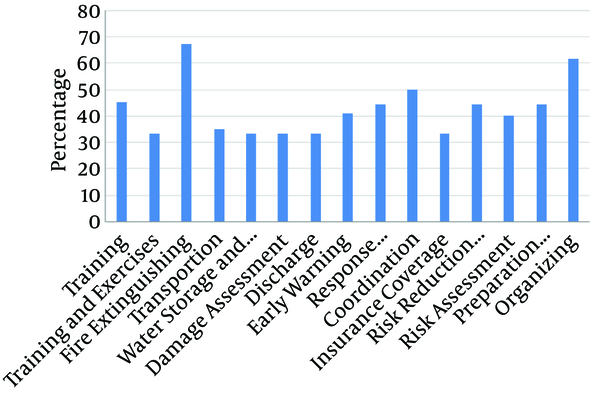 In the present study planning of building risk reduction for health centers, as well as other domains, preparation was less than average (44.4%). Using combustible coatings as ceilings, walls and surfaces coating, and partition with glasses are noticeable. Mohammadi Yegane et al. in their study showed that structural preparedness was 59%.building resistance, strength of the ceilings, internal walls, columns, plastering and partitions were highly vulnerable (18). In most studies the reason for low structural preparedness was lack of adequate supervision by relevant agencies during the construction of health centers, in which structural mitigation mechanisms was not considered. In the current study, discharging or emergency exit was the lowest (33.3%). The study by Mohammadi Yeganeh et al. reported that the emergency exit system in hospitals existed only in 14% of them (Figure 2) (18). In the current study, transfer and evacuation preparedness was 33.3%. In comparison with those of the studies by Daneshmandi et al. (19) (48.8%), Amerion et al. (20) (72% - 100%) and Hojat (21) (39.63%) and In the study by Kovari et al. (22) in Shiraz on the rate of preparation level of training hospitals affiliated to Shiraz University of Medical Sciences they analyzed the preparation level of this part 50%, which was low; but compared with the study by Zaboli and Sajadi (31.6%) (23) and Hosseini shokouh et al. (15) 33.3 % is equal. There was no emergency exit for most of the buildings and most of the emergency exits were closed. Also, there were no guide signs. In the study by Hojat et al. discharge preparedness was 38.9% (Figure 2) (21). For storage of materials and technical equipment, preparedness was about 67.66%, in the study by Arab et al. (14) it was 55.11%, and 20% in the study by Hekmat Khah et al. (13). But food and water storage for emergencies preparedness percent was low (33.3%). The reason for this could be lack of operational programs to predict risks at all levels (Figure 2). In terms of equipment, all of the administrative centers under study such as shelves, computers, and office furniture were in a very bad situation. In the event of an accident they might shut down entirely. Mohammadi Yeganeh et al. reported that safety level for hospital furniture was only 29% (18). Although most of the studied health centers had adequate safety level for fire about 72.45% (Figure 2), they had no information about detection and fire control systems. Despite the fire extinguishers in more centers, they lacked fire alarm systems. Mohammadi Yeganeh et al. reported (2010 - 2011) regarding the fire control preparedness percentage was 57% and emergency exits was 14 % (18). The crisis management situation in health centers of Ahvaz indicated that they did not have desirable or even average points of preparedness (Figure 2); despite the 50% score for functional preparedness, but in domains such as preparedness plan for disaster and emergency risk assessment, risk-mitigation measures, incident commander, discharge, affected population needs assessment, water and food supply, education, training and exercises, preparedness was only about 33.3% (Figure 2). Three was no activity for risk assessment in either of the centers (east and west). Also, reduction risk measures were undesirable and much lower than average (44.4%) (Figure 2). Hosseini Shokouh et al. showed that educational programs would increase preparedness of hospitals (15). Arab et al. studied preparedness of hospitals affiliated to Tehran University of Medical Sciences, which was very low (14). In the study by Amerion et al. 66% of the employees had training preparation (20). Results of the study by Gomez et al. in 29 trauma centers in Canada showed that 43% of them were maneuvering for disasters that are consistent with those of the current study (16). Zaboli and Sajadi (23) carried out a study on communication and information systems related to emergency management. This study showed that personal information was the most important and most vital element for each system, in particular crisis management; if a disaster occurred (Figure 2), information of key personnel were available for rapid reaction to respond (24). In this study, communications and early warning preparedness was 42.6%, which was lower than the average. This result was similar to that of the study by Siddiqi 48% (24); in contrast, Amerion et al. reported 66% - 82% (20); also the study by Zaboli et al. (25) showed that about 33.3% of hospitals had alternative communication systems (Figure 2). 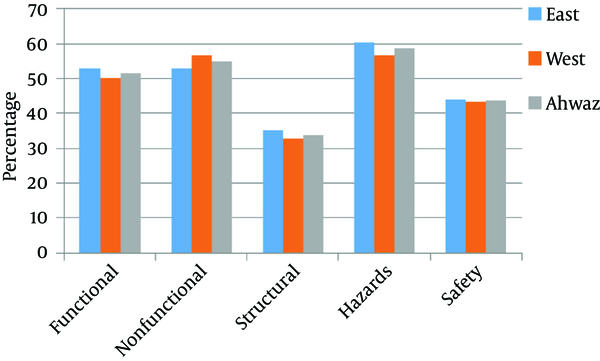 In structures safety preparedness, centers were often in low level and about 33.97% (Figure 1) of the reasons for low levels safety were old buildings of health centers, some rental centers, lack of proper maintenance and lack of technical follow-up for possible vulnerabilities and structural changes in resistance as a result of natural disasters and lack of documents in this regard. Only 33.97% of the results of the current study (Table 1) compared with those of the surveys conducted by Tehran university in (2013 - 2014) showed a preparedness of 30%, in Shahid Beheshti university it was 27.8%, but preparedness percentage for Fars province was 42% and in university of Dezful was 41% and in national level it was 41.1% (26). In general, preparedness of health centers in Ahvaz (east and west) against risks was low. In other words, from 10 score safety was at 4 score, which means an undesirable statues. Therefore there was a need to plan and take measures to improve level of safety. Structural and non-structural preparedness, especially personal training should be considered as a priority by health ministry and local administration to cope with disasters. To increase effectiveness of educational programs not only managers but also other staff should participate in training programs. Managers and other employees should participate in these training programs to increase effectiveness of educational programs, especially around tabulations and field maneuvers. Communication is a part of disaster management programs in health care facilities. Equipment and communication systems are important in communication. Improving communication systems and equipment and personnel training are critical actions before a disaster. Even some staff should be trained to repair communication equipment; as well as device storage. Also, communication with people who have information about the incident is very important. This paper is part of MPH thesis, Shahid Beheshti University of Medical Sciences, Tehran, Iran. Authors acknowledge cooperation of Ahvaz health centers staff. Authors’ Contribution: Mohsen Kooti, implementation of the thesis; Abdolkazem Neisi, the co-supervisor; and Hossein Hatami was the supervisor. 1. Yasuyuki S, Fauziah Z, editors. Disaster Management in ASEAN. ERIA Discussion Paper Series; 2012. 2. Sawada Y, Shimizutani S. How Do People Cope with Natural Disasters? Evidence from the Great Hanshin-Awaji (Kobe) Earthquake in 1995. J Money Credit Bank. 2008;40(2-3):463-88. doi: 10.1111/j.1538-4616.2008.00122.x. 3. Yi P, George SK, Paul J, Lin L. Hospital capacity planning for disaster emergency management. Soc-Econ Plan Sci. 2010;44(3):151-60. doi: 10.1016/j.seps.2009.11.002. 4. World disasters report: Focus on urban risk. Lyon; 2010. 5. Hosseini Shokouh SM, Anjomshoa M, Mousavi SM, Sadeghifar J, Armoun B, Rezapour A, et al. Prerequisites of preparedness against earthquake in hospital system: a survey from Iran. Glob J Health Sci. 2014;6(2):237-45. doi: 10.5539/gjhs.v6n2p237. [PubMed: 24576386]. 6. Pujawan IN, Kurniati N, Wessiani NA. Supply chain management for Disaster Relief Operations: principles and case studies. Int J Log Syst Manag. 2009;5(6):679. doi: 10.1504/ijlsm.2009.024797. 7. Bulut M, Fedakar R, Akkose S, Akgoz S, Ozguc H, Tokyay R. Medical experience of a university hospital in Turkey after the 1999 Marmara earthquake. Emerg Med J. 2005;22(7):494-8. doi: 10.1136/emj.2004.016295. 8. Gupta SH, Kant S. Emergency medical services and disaster management. 2nd ed. New Delhi: Gaypee Inc; 2004. 9. World Health Organization . Risk reduction and emergency preparedness, WHO six-year strategy for the health sector and community capacity development. 2007. 10. Ardalan A, Shariatikennedy M, SadeghiGhotbabadi M. Disaster risk assessmenr in the health care network in terms of performance,nonstructural and structural. Theran: Raznahan; 2011. 11. Rabeian M, Hoseini SH, Radabadi M, Taheri Mirghaed M, Bakhtiari Aliabad M. Evaluation of the factors affecting the level of preparedness to deal with the earthquake risk in the hospitals of Medical Sciences, Tehran University of Medical Sciences, Tehran [in Persian]. J Payavard health. 2012;7(3):251-61. 12. Salari H, Heydari AR, Jolaei H, Rahimi SH, Shafaghat T. Prepardiness of governmental and private hospitals of Shiraz to deal with disasters in 2009 [in Persian]. Sci J Resc Relief. 2010;2(4):1-10. 13. Hekmat Khah A, Rahimi H, Kamaliaghdam M, Taghavi Shahri SM, Sadeghifar J, Hamouzade P. Assessing the preparedness rate against earthquake riskin hospitals affiliated to Urmia University of Medical Sciences [in Persian]. J Urmia Nurs Midwif Facul. 2011;10(2):200-8. 14. Arab M,, Zeraati H,, AkbariHaghighi F, Ravangard R. A study on the executive managers' knowledge and performance, and their hospitals preparedness against earthquake events and theirrelationships at public hospitals (affiliated by Tehran University of Medical Sciences (TUMS); 2005-2006 [in Persian]. J Health Admin. 2008;11(34):7-14. 15. Hosseini Shokouh SM, Arab M, Rahimi A, Rashidian A, Sadr Momtaz N. Preparedness of the Iran University of Medical Sciences hospitals against earthquake [in Persian]. J School Pub Health Inst Pub Health Res. 2008;6(3-4):61-77. 16. Gomez D, Haas B, Ahmed N, Tien H, Nathens A. Disaster preparedness of Canadian trauma centres: the perspective of medical directors of trauma. Can J Surg. 2011;54(1):9-16. [PubMed: 21251427]. 17. Veenema TG. Expanding educational opportunities in disaster response and emergency preparedness for nurses. Nurs Educ Perspect. 2006;27(2):93-9. [PubMed: 16733973]. 18. Mohammadi Yeganeh SH, Assadi Lari M, Seyyedin SH, Maher A. Assessment of qualitative and quantitative performance of equipment and the non-structural vulnerability of Tehran's elected public hospitals during an earthquake [in Persian]. Sci J Resc Relief. 2011;3(1-2):1-9. 19. Daneshmandi M, Amiri H, Vahedi M, Farshi M, Saghafi A, Zigheymat F. Assessing the level of preparedness for confronting crisis such as flood, earthquake, fire and storm in some selected hospitals of Iran. Milit Med J. 2010;12(3):167-71. 20. Amerion A, Delaavari AR, Teymourzadeh E. Rate of preparedness in confronting crisis in three selected border hospitals [in Persian]. Journal Mil Med. 2010;12(1):19-22. 21. Hojat M. Disaster preparedness in hospitals of Jahrom University of Medical Sciences (2010) [in Persian]. J Qazvin Univ Med Sci. 2012;16(3):72-7. 22. Kavari SH, Moslehi S, Panahi A. Crisis Management at Hospitals Affiliated to Shiraz University of Medical Sciences. Health Info Manag. 2008;3(2):35-41. 23. Zaboli R, Sajadi HS. Assessing hospital disaster preparedness in Tehran: Lessons learned on disaster and mass casualty management system. Int J Health Sys Disas Manag. 2014;2(4):220. 24. Seyedin SH, Sajjadi H, Zaboli R. The status of the emergency information and communication system in iran's health sector. Dir Gen. 2012;9(1):63. 25. Zaboli R, Tofighi S, Amerion A, Moghaddasi H. Survey of Tehran City Hospitals Disaster Preparedness for Disaster [in Persian]. J Mil Med. 2006;8(2):103-11. 26. National Safety Report. Treatment and medical education [in Persian]. Islamic Republic of Iran: Health centers in disaster management and disaster risk reduction; 2013.